With the right forecast it is still a gamble to travel to this side of the lakes and have the right conditions to fly on the Screes. This is probably why it is so infrequently flown, usually by the few locals over here. Despite the chance of of a long drive for nothing, the views over the green pastures and Wastwater makes this the most remarkable site to fly. Experienced pilots may jump the gap onto Scafell and back, but be careful of unexpected sink or rotor from the crags that lead all the way up to the summit. The Screes face NW, but be aware that on a sunny summer's day the sea breeze can turn the wind into a westerly and blow up the valley. NNW can oppose the influence and produce a convergence line marked by a continuous cloud. If taking off from the lower take-offs, be wary of localised compression at any point along the Screes ridge - keep forward and progress slowly if unsure. Beware of rotor to west side of take off from Greathall Ghyll, especially if the wind is off the hill. Certainly a site everyone must visit a few times in their flying career. Nether Wasdale. Park at Forest Bridge car park 500m SE of Nether Wasdale. Through Nether Wasdale (from Gosforth), turn right, then immediately left over bridge, and up farm lane to Easthwaite Farm for permission to use landing field . If you ask the farmer you may be allowed to park at the farm, and then walk up. Otherwise, return to park at Forest Bridge (just south east of Nether Wasdale). 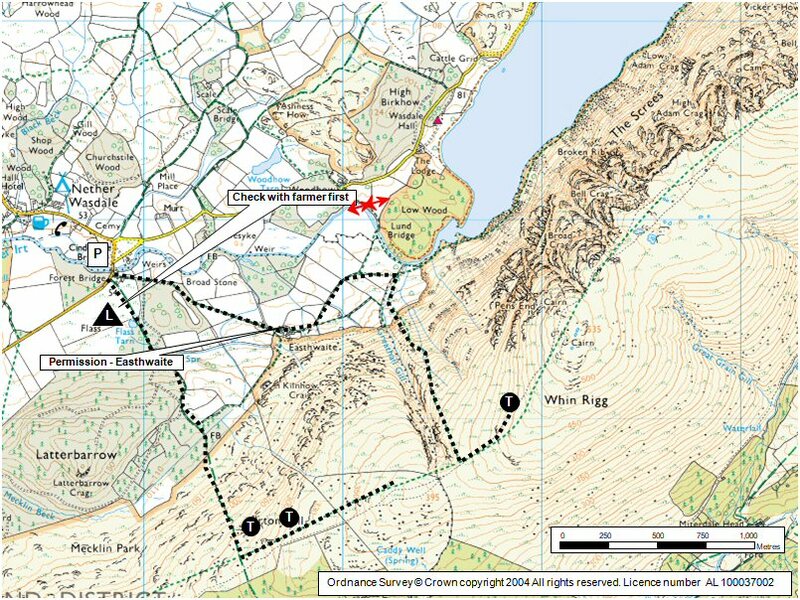 The official landing field is 0.6 km SE of Nether Wasdale village - at the foot of Latterbarrow Fell (forest), next to the road. At the bridge crossing the River Irt, there is a car park, dirt track to Easthwaite Farm, a white house, and a pedestrian gate to the bridle path that leads through the landing field and up to the original Take Off. There are no power cables in this field. If you walk up from here, you just follow the bridle path SE for 30 minutes until you get to the first Take Off option on Irton Fell (not Irton Pike). Until you get to this height, the wind direction and strength can be misleading. If it is too light, or you want more height, continue NE. In strong conditions there is some rotor or sink below take-off from Latterbarrow in front. [Note for HG pilots: The forestry road at the rear of Irton Fell can be driven to 300m from take off but the gate is often locked and obtaining a key requires inside knowledge I haven’t got. Driving up is really the only option for HGs followed by a relatively straightforward 20 minute carry. If you need even more height then you should join the path that takes you to the top of the screes in about 35 minutes where there is a huge ideal take off as described next. Alternatively, if you want to walk directly to the start of the Screes - so you have as much height as possible in the shortest time (ie it’s steep) - drive down to the YHA at the SW end of Wastwater. Park on the lane west of the entrance. Note: It’s tempting to land here, even on a PG, but trees / power line / sloping ground make it tricky. I would recommend the official landing field described above which is ideal. Walk back along the lane (SW) to a steel ‘kissing gate’ and cross a field down to the river. Observe the second field on your LHS (which is not an agreed landing field). Take note of the power lines crossing the lower corner (high lighted in RED on plan). Continue up the river and cross the footbridge. Walk up stream again and then turn right and cross the lane via gates into a field below the fell. Huff and puff and sweat for 30 minutes straight up the fell via a small gate. Half way up you leave the bracken and it gradually starts to get easier. NOTE the big gulley on your right Greathall Ghyll). Keep well away from this when taking off or flying low. Keep walking up until you’re happy you can take off and stay up. Then walk some more! No need to ask to fly on the Screes or take off from on the fell. If there's no sheep in the official bottom landing field then you shouldn't need to ask the farmer to land there (he's pretty easy going). Please ask if it's early in the year and there are sheep that might be due to lamb. Eastwaite Farm. If the wind at take off is fresh, then don't fly. If the wind is moderate then there should be no problem. Beware of rotor to west side of take off from Greathall Ghyll, especially if the wind is off the hill. You can soar the length of the Screes with ease if you stay near the ridge height. However, you can soon loose lift at ¾ height or less. The Screes run directly into the lake at a steep angle with very little landing options. If you do loose lift, don’t hang about, take the quickest route out of there (shortest or direction of your fastest beat). There are plenty of landing options at either end of the lake but only spot landings below (between large loose scree) - and a technical walk out. The flat top if ok for landing in a light breeze, but possible rotor in mod / fresh winds. Experienced pilots might fly across the Burnmoor gap, and onto Scafell and back again. It’s a long glide across and the next obvious lift is where the west face of Scafell drops off suddenly at Black Crags. Approach with caution as sometimes you find lift over the lip and other times you enter sink! Thermals can pop up here or further out. If the wind is off to the North, as you approach the summit of Scafell, Scafell Pike (the next hill) might give you rotor or complex air. Beyond Scafell the topography gets complicated, and the wind direction / lift / sink is no predicable. Only UK mountain experienced pilots should play in his area which is a junction of major valleys. [Note for HG pilots: The forestry road at the rear of Irton Fell can be driven to 300m from take off but the gate is often locked and obtaining it requires inside knowledge I haven’t got. Driving up is really the only option for HGs]. For hang glider pilots it is possible to arrange access through the forestry to arrive at an area in the forest behind take off leaving a relatively straightforward 20 minute carry. If you need even more height then you should join the path that takes you to the top of the screes where there is a huge ideal take off described next (another 30 min walk). However, if you want to walk directly to the start of the Screes, so you have as much height as possible in the shortest time (ie it’s steep), drive down to the YHA at the west end of Wasdale. Park on the lane west of the entrance. Note: It’s tempting to land here, even on a PG, but trees / power line / sloping ground make it tricky – I would recommend the official landing field described above which is ideal. Walk back along the lane (SW) to a steel ‘kissing gate’ and cross a field down to the river. Observe the second field on your LHS (which is not an agreed landing field). Take note of the power lines crossing the lower corner (see plan). Continue up the river and cross the footbridge. Walk up stream again and then turn right and cross the lane via gates into a field below the fell. Huff and puff and sweat for 30 minutes straight up the fell via a small gate. Half way up you leave the bracken and it gradually starts to get easier. NOTE the big gulley on your right*. Keep well away from this when taking off or flying low. Keep walking up until you’re happy you can take off and stay up. Then walk some more! The official landing field is 0.6 km SE of Nether Wasdale village - at the foot of Latterbarrow Fell (forest), next to the road. At the bridge crossing the River Irt, there is a car park, dirt track to Easthwaite Farm, a white house, and a pedestrian gate to the bridle path that leads through the landing field and up to the original Take Off. RE hang glider pilots, it is possible to arrange access through the forestry to arrive at an area in the forest behind take off leaving a relatively straightforward 20 min. carry. The notes for paragliders generally apply. Excellent with good potential. Consider bottom landing areas before flying ... especially if going north and you get low. No official bottom landing field. If the wind at take off is fresh, then don't fly. If the wind is moderate then there should be no problem. You can soar the length of the Screes with ease if you stay near the ridge height. However, you can soon loose lift at ¾ height or less. The Screes run directly into the lake at a steep angle with very little landing options. If you do loose lift, don’t hang about, take the quickest route out of there (shortest or direction of your fastest beat). There are plenty of landing options at either end of the lake but only spot landings below (between large loose scree) - and a technical walk out. The flat top if ok for landing in a light breeze, but possible rotor in mod / fresh winds. Almost forgot to mention Sea Breeze! On a sunny summer’s day the sea breeze will probably turn the wind into a westerly and ‘off’ the Screes ridge. From a safety point of view this isn’t an issue except for rotor thrown off the gulley mentioned above* near take-off. But if you’ve driven a long way it’s a bugger! However, if the prevailing wind is forecast to be a moderate (not light) NNW on a sunny summer’s day, the inevitable sea breeze will bring it more on the hill in the afternoon. The lake gives you a good indication of wind strength and direction at ground level. If you wish to land at Wasdale Head the normal landing field is the overflow car park (rarely used field) between the main car park and the toilets / barn. For the experienced pilot, the XC potential is excellent. It is a natural decision to jump across to Scafell and then back onto Crinkle Crags, across Wrynose Pass and onto the back of Coniston Old Man. Walla and back is possible to on a good day.